Planet Baobab is fun and accessibly priced. It has a relaxed, rustic atmosphere and is casual and friendly. Planet Baobab is a traditionally styled mud Kalanga and Bushmen grass hut village shaded by giant baobab trees, whose average age is 4 000 years old. Baobab presents an accessibly priced Makgadikgadi experience which provides an opportunity for guests to learn more about Botswana's culture and traditions, and the intriguing geological origins of the Makgadikgadi Pans. Activities include tracking the elusive Elephant, visiting stone tool sites of early man as well as guided walks from Planet Baobab - introducing you to the cleverly adapted fauna and flora of the Kalahari Desert. A visit to Planet Baobab and the Kalahari Surf Club offers cultural understanding, insights into the history of early man and ecologically correct access to the mysterious beauty of the Makgadikgadi. It's also the funkiest desert oasis around. Planet Baobab is for those who seek adventure, for independent or budget travellers, the self-drive market, families or large groups. It is also perfect for office parties, conferences or corporate retreats. Planet Baobab is an ideal stop over en-route to Maun from Johannesburg or Victoria Falls / Kasane. Instead of camping in Maun, you can stay overnight at Planet Baobab and drive through to Maun in less than 2 hours for flights / transfers into the Delta the following day. 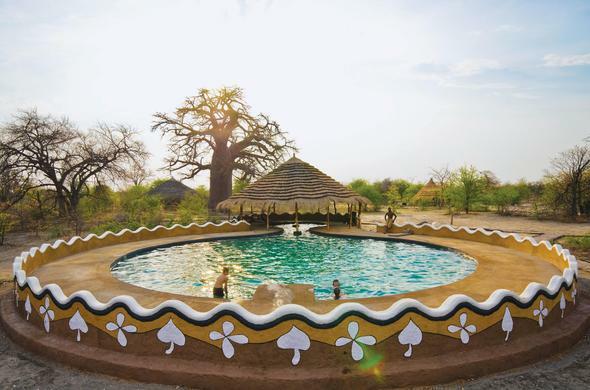 Planet Boabab has been designed to appeal to all ages from bush-mad families, local people, nomadic travellers and adventurous senior citizens, whom are obviously treated with special respect, as is the African tradition. Planet Boabab guides and management staff have all passed a comprehensive First Aid Course conducted by the Medical Rescue International. All guests are covered by Planet Boabab's insurance to be evacuated in a fully equipped medical aircraft, which will get them to the nearest and best medical attention in the region. Planet Baobab is a relaxed, casual and friendly; it is a traditionally styled mud Kalanga and Bushmen grass hut village shaded by giant baobab trees.